With its sweeping lakeside views and convenient location, Sophie Griffiths finds Haven’s Lakeland park to be an ideal base for exploring the landscapes of the Lake District. "Our parks are also perfect for couples or groups of friends who are looking for a few nights away who want to enjoy the parks and also use them as a base to explore the local area"
A family is eyeing us with interest. They stand among the reeds and rushes, shaking themselves dry. The younger ones toddle along the banks chattering among themselves as their mother rushes to keep up, scolding them loudly. Their father lingers, before turning with a snort and a honk to waddle after his brood. It is 11pm but it’s summer and in Cumbria, where we have escaped from London for the weekend, the sun’s last rays leave streaks of scarlet and mauve across the sky. We watch the swan family disappear into the rushes, and drink in the tranquillity. I’ll be honest; this is not what I expected from a Haven holiday park. We are at Lakeland, near the ancient village of Flookburgh. The campsite has amenities to suit every need – from arcades and swimming pools (both indoor and out) to woodland trails to keep kids happy and evening shows to entertain their parents. This, I anticipated. The calming, peaceful lakeside experience we are currently savouring from the balcony of our caravan, I did not. It is this side of Haven that the brand is particularly keen to remind potential customers of. “It’s not that we’re moving away from family holidays,” explains Erman Housein, head of trade sales and marketing at Bourne Leisure. My girlfriend, Georgie, and I are more than happy to explore this string further. We travel up from London on Friday and arrive in the evening, just in time for steak and chips at the Lakeside Bay Bar and Restaurant and a quick peek at the evening’s entertainment (a dance act) before we retire to the tranquillity of our lakeside caravan to enjoy a glass of rosé as the sun sets. Our caravan is one of several set around the small man-made Otter Lake. It is tardis-like, every door seeming to open into a secret bedroom (it sleeps six in total) while offering a spacious kitchen with full amenities and a cosy living room area leading out onto a balcony that we make full use of during our stay. In the mornings we sit and eat pastries and watch the lake come to life as the various duck, geese and swan families rouse themselves and chase each other across the water. In the evenings we sip wine and play cards in the twilight, watching out for the swan family who appear on the banks without fail; the parents searching for crumbs while the cygnets shake water from their downy tails. It is our first time in the Lake District and we are keen to make the most of both the Haven park and the local area. We wake early on Saturday to a deep blue sky. The day is already warm and we agree it’s perfect weather to try out Otter Lake’s water-based activities. Pedalos, kayaking, canoeing and paddle-boarding are all on offer and all reasonably priced, costing between £10-15. 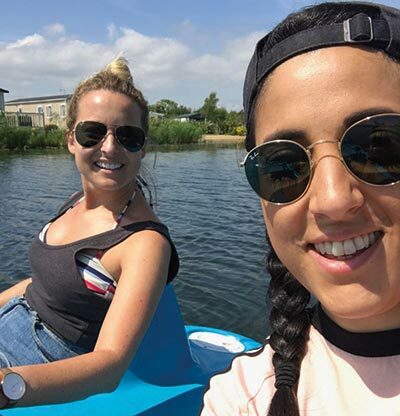 However, the latter three all demand covered footwear (the man-made lake being shallow and apparently full of potentially sharp pebbles), so we opt for pedalos instead. We pedal gently around the lake’s edge, waving at our little home as we pass by. At one point we draw level with a group of children paddle-boarding – just in time to see one girl wobble precariously before she plunges into the water, with a burst of laughter, much to the amusement of her watching parents. Later, we enjoy a long, winding walk around the site, dodging a group of boys on their bikes as we take in some of the woodland trails. At one point we climb a ridge bordering the edge of the campsite and find ourselves gazing out on to a vast expanse of mudflats, where tiny waves from the Irish Sea lap the distant shoreline. That evening we cook outside, picking up supplies – including a disposable BBQ – from the well-stocked onsite supermarket. The swan family arrive as we eat, pecking and cleaning their feathers, gabbling among themselves as they waddle along the banks. On Sunday, we decide to explore further. Housein says Haven parks are perfectly located for those wanting fun parks and facilities, but who also want a base to discover new regions of the UK. And for this, Lakeland is perfect. The campsite staff are knowledgeable and eager to offer advice – they explain which lakes offer the best hikes and which the best swimming. Such information, Housein says, will become more prevalent on the Haven website and brochure in 2019. “It’s about what’s around the parks as well as just what’s in them,” he explains. “We previously had bullet points highlighting that a castle was X miles away, for example, but next year there will be more details. And, when we go to speak to travel agents, we can tell them what’s in the local area. We’re trying to get the message across to them,” he adds. Such information is invaluable for customers when staying in an unfamiliar area, and so it proves for us. 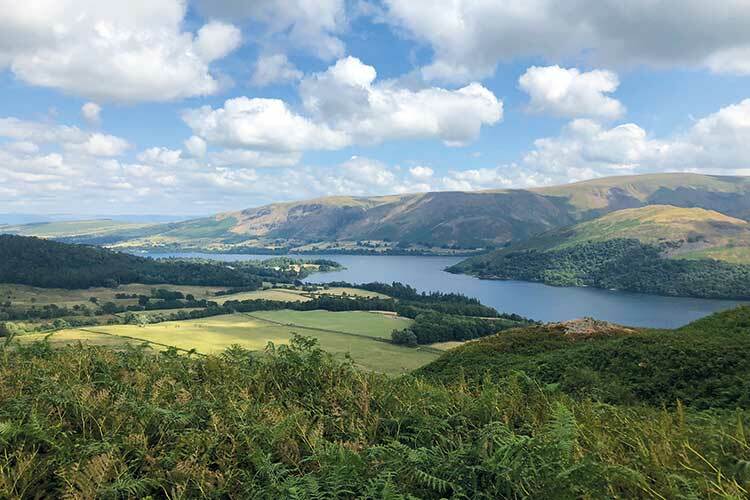 We opt for the Ullswater Way, a 10-mile hike along the edge of Ullswater lake from Pooley Bridge to Glenridding, where we ramble across moorland, navigate our way through fields of cows, clamber through rocky pools, paddle beneath a waterfall and traverse rocky hilltops, gazing down at breathtaking scenery below us. Undulating hills, patchwork fields and looming mountain tops surround the deep blue of Ullswater, whose waters are broken every now and then by the steamships that glide between each end. We make it in four-and-a-half hours and arrive panting onto Glenridding’s jetty, just in time to catch the last boat of the day, which takes us back to Pooley Bridge, where we enjoy a well-earned pub meal of fish and chips. That night we soothe our aching limbs and enjoy a glass of wine on the balcony as we drink in the serenity one last time. As dusk sets in we hear the laughter of children and adults returning from the evening entertainment, but we’re busy delighting in our own evening show – bats dance and swoop above us, stars begin to prick the night sky and the ever-present cygnets chirrup and squabble. Book it: A three-night break starts from £112 for a family of four sharing a Standard two-bedroom caravan, departing on March 15, 2019.